Last week I came across a scenario where Alternate Login ID feature of Active Directory Federation Services (AD FS) came at its best. 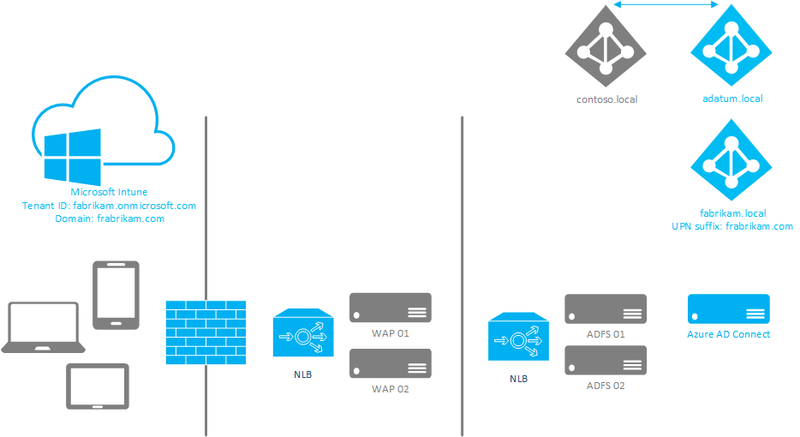 Part of an Enterprise Mobility Suite (EMS) implementation we were facing a challange to overcome. In this scenario the customer has multi-forest (fictive contoso.local & adatum.local) AD structure with a two-way forest trust relationship. The user resources are currently located in te frabrikam.local (blue) where all server resources are part of the contoso.local (grey) domain including AD FS. 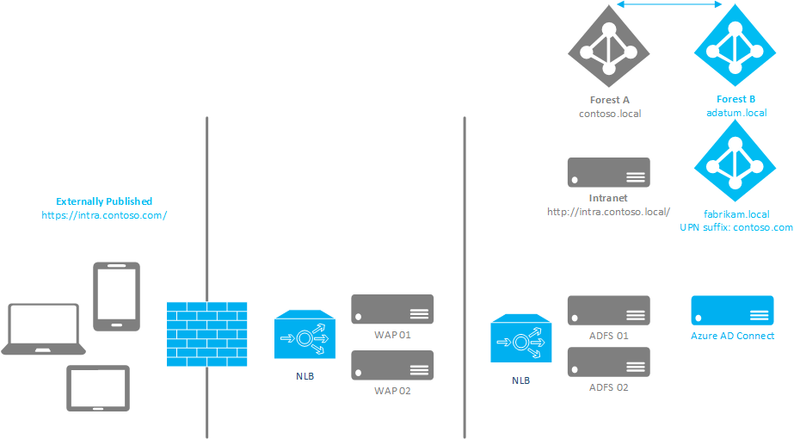 As fabrikam.com is the public domain namespace used, we added a UPN suffix for the fabrikam.local domain to make sure the user objects synced from the on-premise Active Directory – by Azure Active Directory Sync – matches the public User Principal Name (UPN) domain namespace. UPDATE! A private hofix (for now) is available that fixes URL length issues with Windows Application Proxy (applicable for NDES deployments) KB523052. This hotfix can be requested through a PSS case. For more details click here. 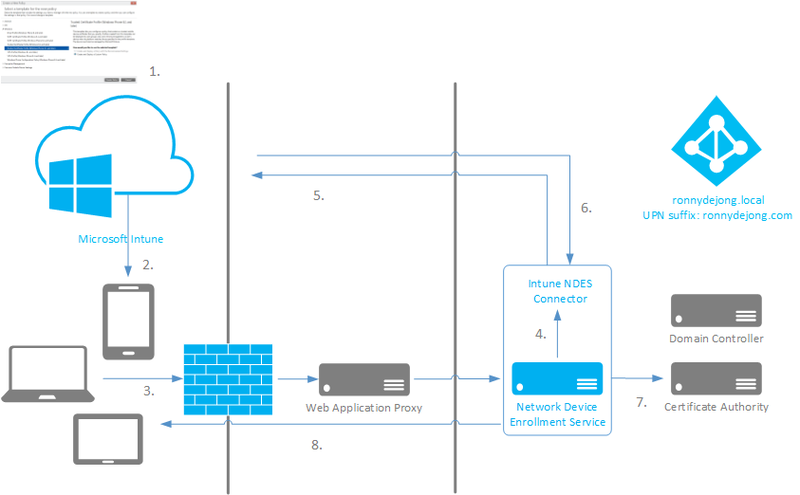 For those who are using Web Application Proxy (WAP) and intent or already have been published Network Device Enrolment Service (NDES) might noticed this isn’t working, even when pass-through preauthentication is configured. This post will go into details how NDES is working including a brief explanation of the issue. 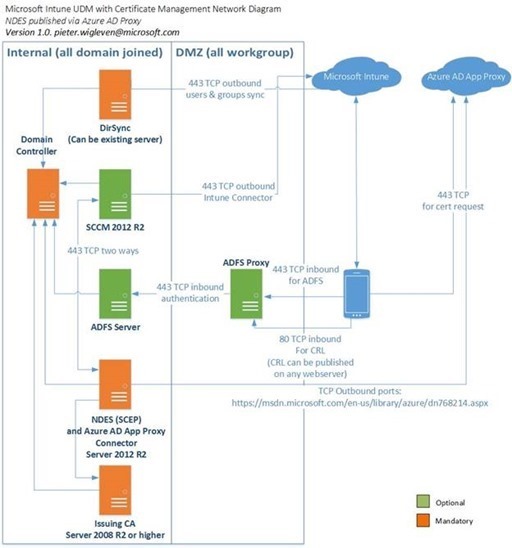 The Network Device Enrollment Service (NDES) allows mobile devices running without domain credentials to obtain certificates based on the Simple Certificate Enrollment Protocol (SCEP). The user certificates can be used for managing company resource access (E-mail, WiFi- and VPN profiles) instead of using user name + password. This existing technique is recently emphatically re-evaluated by the use and application for mobile device management in relation to BYOD scenarios.